1. From the grid frame for Resources, click the Edit icon to display the details page for the AppServer broker for which you want to initiate add or trim request. See Accessing OpenEdge Management resource information for the detailed steps. 3. From the drop-down list box, select Add or Trim. 4. In the server(s) field, enter the number of servers you want to add or trim. The value you enter must be a positive integer. 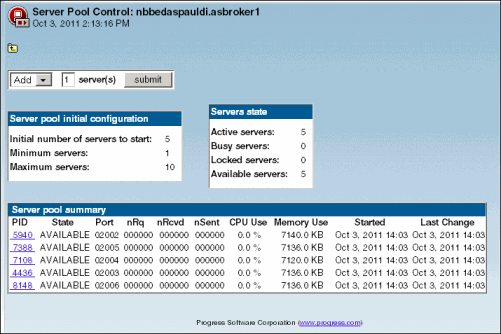 See Server pool initial configuration for information about these configuration details. 5. Select Submit. Depending on the changes you make and OpenEdge Management's capability to implement them, you might notice changes to the numeric values shown in the Serversstate table. See Servers state for more information. Note: Any time you either add or trim AppServers, it is recommended that you refresh the management console to ensure that you are not viewing stale data.